If you've been following, you know it was a crazy week for me, cooking for all the volunteers and kids at Sport's Camp! I didn't have a lot of time to discover unexpected and wonderful things... if I wasn't cooking or at camp, I was [usually] sleeping! Here are the unexpected and wonderful things I would like to share with you this week! The digiscrap forum is hosting it's first ever Blog Train this month! There are 23 stops along the way and each one showcases a unique and collaborative design kit - for free! Plus, my favorite part, you get exposed to 23 different designers and their designs! I first found Meg through Jessica's Red, White and Blue Round-up over at My World-Made By Hand. 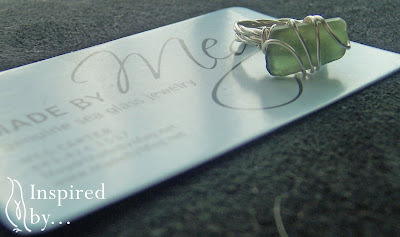 I enjoyed her featured post and instantly fell in love with her sea glass jewelry. I had been looking for something special and unique for a friend of mine for a while, and when I saw Meg's work I knew I'd found it. Of course, I just had to get a little something for myself! Trust me, my lack of photographic skills do not do this ring justice. 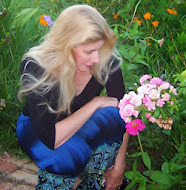 I would have used Meg's picture, but since they are one of a kind, it's no longer up on her site. She even sized the ring for me - I just love it! And the necklace I got for my friend is gorgeous! If you're looking for a unique, one of a kind gift, I highly recommend Made by Meg! I've been using Pinterest for a few weeks now and really love it! I'm a visual person and it is sooooo much easier to find what I'm looking for on my Pinterest boards than in my favorites or bookmark folders. I often don't remember what something is called, but "know it if I see it!" Can you relate? Well, Pinterest is perfect for organizing those things you "see" on the web and want to find again! Check out my boards and let me know what you think. If you're interested in trying Pinterest yourself, send me your email and I would be happy to send you an "invite!" Have you been featured on Serendipity Sunday? Yay!! I am so pumped that the tutorial "inspired" you;) The cork board is really cute....as is the gorgeous ring! WOW! You are too sweet! Thank you so much for featuring my jewelry. I am so happy your friend liked her necklace and you are loving your ring. :) You made my day!